The Cheviot Hills Recreation Center and its Rancho Park Golf Course sit on an 1821 Spanish land grant: Rancho Rincón de los Bueyes . Sons of o ne of the Rancho's first grantees, Bernardo Higuera, sold sections of the rancho to Don José de Arnaz in 1849 (Secundino Higuera) and 1867 (Francisco Higuera). By 1875, Arnaz had subdivided the hilly northwest sections of the grant into Lots A through E, ranging from 73 to 126 acres. Lots B and C (shown as 104 acres each) would become the bulk of the Recreation Center land – after passing through a few more owners. Arnaz' 1875 subdivision map with Lots B & C highlighted. Lot D for $3640 (about $35 per acre) ; and he took Lot C on July 29, 1896, for $4700 (about $45 per acre) . Gilmore (1850-1918) was a dairy farmer who had struck oil while drilling for water. His son, Earl B. Gilmore (1887-1964), developed Gilmore Oil Company . The family still owns Farmers Market at Third and Fairfax . On May 26, 1920, a Simon W. Straus' enterprise (through attorney Henry W. O'Melveny) bought an 187-acre parcel from Burkhard Investment Company for $1200 an acre ; it would be the Ambassador Hotel 's golf course and country club site. Golf historian John "J.I.B." Jones reports that O'Melveny became the Ambassador golf club's first president. William Herbert Fowler (1856-1941) designed the golf course. According to Jones, Fowler laid out an 18-hole, par-72, 6,250 yard long golf course that made full use of the many hills, ditches, and arroyos. The Ambassador links opened on July 26, 1921 . Ambassador Hotel architect Myron Hunt designed the clubhouse. Over the years, the course was reconfigured (and renamed) as detailed in Jones' " Rancho Park History 1921-2008 ." In 1882 Frederick W. Straus established the business of selling first mortgages on small improved property in Chicago. In 1895, he was joined by his son Simon W. Straus, and together the family operated several corporations under the name S. W. Straus & Co. Straus began selling third party corporate bonds secured by real estate mortgages. Some mortgages, such as that on its Ambasador Hotel in Los Angeles, were overvalued in order to leverage more funds. Straus also sold unsecured mortgages to those who relied on the company's prior bona fides. The October 24, 1929, stock market crash, and "the depression which followed" laid bare the schemes, and they may have taken their toll on the Strauses themselves: Simon W. Straus died on September 7, 1930; his son-in-law, Herbert S. Martin, died in 1930; S. J. Tilden Straus, his brother, and Walter S. Klee, his nephew, died in 1932. The Strauses left ruinous debt in their wake, including unpaid taxes going back to 1920. So, as "security for the payment of $826,703.84 taxes, the Commissioner of Internal Revenue took an April 12, 1933, deed of trust on the Rancho Golf Club (and on interests in some Chicago property). When the debt went unpaid, the property went into receivership. The Straus' customers were also left in the lurch: " On the date of the receivership, March 3, 1933, there were $360,000,000 bonds unpaid, held by 80,000 bondholders. " In January 1934, the Internal Revenue Commissioner could not sell the course except for a fraction of its true value (appraised in October 1933 as having a value of $500,000), so he entered into a subsequent trust document and continued lease it out. The January 1934 trust agreement "provided that the Commissioner of Internal Revenue, as trustee, would make no sale or conveyance of the properties prior to January 1, 1937, without the written consent of the Rancho Golf Club . . . and Samuel J. T. Straus, Chicago, Ill., or in the event of his death or disability, by certain other named members of the Straus family." ( Comptroller General's August 1934 opinion for the Secretary of Treasury .) The Commissioner did, however, auction the club's furniture, silverware, and course maintenance equipment on August 30, 1934 . The course's neighbors took notice; they did not want the land sold off and redeveloped. 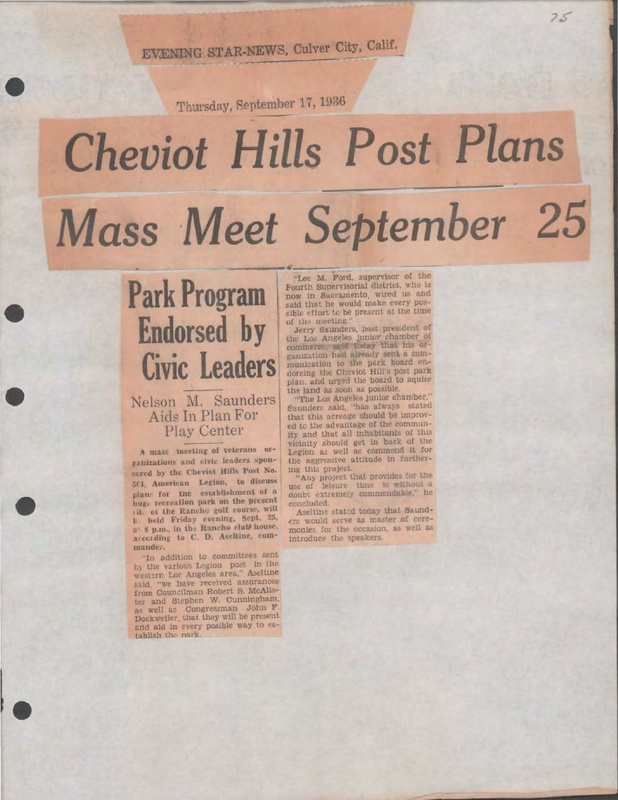 On September 15, 1936, with the USGA's lease set to expire, Cheviot Hills American Legion post #501 commander C. D. "Ace" Aseltine launched a drive to establish a recreation park on the site of the bankrupt Rancho Country Club . T he Legionnaires " pointed out that . . . Los Angeles [had] not one single large park west of Western Avenue, [and that] in view of this fact, Western Los Angeles was entitled to such a place for recreational purposes. " 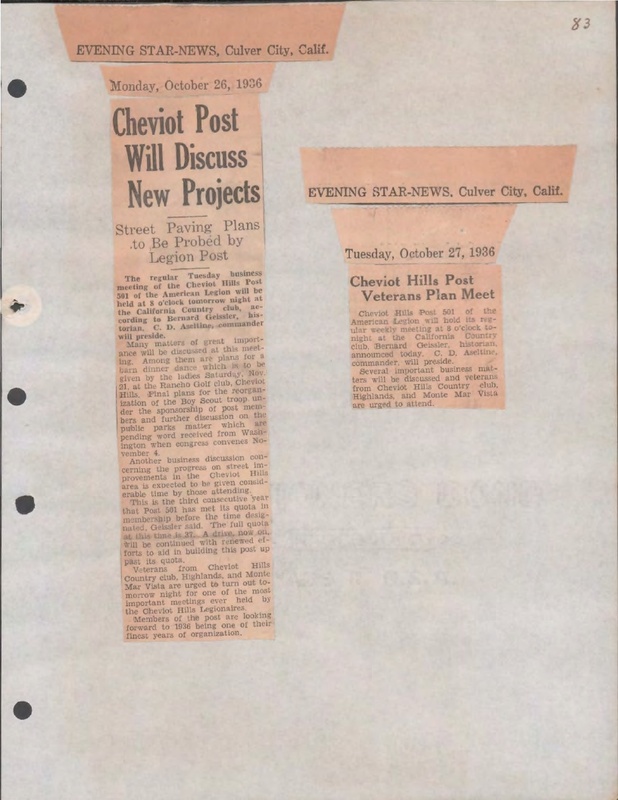 Newspaper clipping in " History of Cheviot Hills Post #501 , The American Legion, Fiscal years 1934-35-36-37." The American Legion history shows they gathered support from civic leaders including councilmen, county supervisors , Congressman John F. Dockweiler, Hamilton High School faculty, Emerson and Overland schools' PTAs, and numerous other civic organizations, as well as the other American Legion posts. The campaign took their long commitment. In January 1939, legislation was planned to trade the city-owned Reeves Field (formerly Allen Field, San Pedro's municipal airport) on Terminal Island for the federally-held Rancho land. The City of Los Angeles was leasing the field for Army and Navy use. ( Here is an excellent history of Allen/Reeves Field .) Indeed, the March 13, 1939, Congressional Record shows a petition " Resolution of the Board of Playground and Recreation Commissioners of the City of Los Angeles, relating to a proposition which, if enacted, would grant Reeves Field, now owned by the city of Los Angeles, to the United States Navy, etc. " was referred to the Committee on Public Lands. The trade was not to happen. Indeed, another Congressional record shows a 1940 federal threat to "expropriate Reeves' Field Airport" because it was on reclaimed land . The photograph below was captioned, "When golfers, officials and fair scorers gather at the Rancho Golf Club Sunday afternoon, May 21, for the P.G.A.-amateur team matches the 'Spanish influence' will be felt, as the girls will be garbed as señoritas – more or less – with wide brimmed sombreros, etc." What would Higuera, Lopez, or Don José thought? When the Commissioner decided the time was right to sell, various creditors – including the city, county, state, school district, and other tax-levying districts – had claims against the Rancho property. On July 8, 1942, the United States attorney sued to clear title , alleging (according to the Los Angeles Times) that "club owners and operators owe the Federal government $831,703 in taxes and that the government's claims to title to the property should take precedence." Along with the taxing authorities, the defendants included Nomis-Suarts Corp. ( owner of the Ambassador Hotel & Investment Corporation stock which, in turn, owned the Rancho Golf Club stock ), Winifred Nichols (wife of A. Laverne Nichols, general manager under the USGA lease, who died on June 5, 1942 ), and Cheviot Hills Post No. 501, American Legion (which leased the clubhouse for meetings). USGA operation would cease at the end of 1942, but the Commissioner kept the club running. On September 27, 1942, the Los Angeles Times announced that the Bureau of Internal Revenue would accept bids for a three year lease , beginning on December 1, 1942, on the Rancho Country Club property. In November 1942 (six years after the American Legion post began its campaign), it was announced that the City of Los Angeles would lease the Rancho Country Club from the Federal Government. Newspaper clipping in " American Legion Auxiliary Scrapbook 1942-1943. " It took four years for the federal government's lawsuit to be resolved. On January 8, 1946, the Los Angeles Times reported that the City had agreed to buy the course , and, on March 8, 1946, the Los Angeles Times reported settlement of the federal lawsuit had cleared title: " Under the settlement, the city will take title upon payment of $200,000 to the Collector of Internal Revenue. " Historian Jones reports a higher price: "The Golf division of the Recreation and Parks Department of the City of Los Angeles purchased the old Rancho Golf Club for $225,643, mostly to cover overdue Los Angeles County tax bills in 1946" with the money coming from "surplus revenues from the operation of other city golf courses, principally those of Griffith Park." ( The Rancho Golf Course Opening (1949) .) Anticipating oil and gas production on the site, the March 7, 1946, minutes of the Los Angeles City Council reveal a higher price that the federal government is still receiving: " 6-1/4% of the amount or value of oil or gas that may be produced ." Groundbreaking was set for March 23, 1946 , almost ten years after Ace Aseltine and the American Legion began their effort. After "three years of construction and 'one and quarter million cubic yards of earth' moved" the private Rancho Country Club became the public Cheviot Hills Recreation Center. ( The Rancho Golf Course Opening (1949). ) It included the Rancho Park Golf Course , "an 18-hole, par 71 championship course playing at 6,630 yards, designed by William Johnson and William P. Bell" which opened with the 1949 U.S.G.A. Public Links Championship. (The City of Los Angeles Golf Division reports that it hosted 18 Los Angeles Opens and numerous LPGA and Senior tour events between 1978 and 1994 .) The City also added the 9-hole Rancho Park 3-Par Golf Course (opened in 1948 and also designed by Johnson & Bell), a double decked driving range, several putting greens, and a new clubhouse ( designed by George M. Lindsey ) with a " lounge, coffee shop and dining room, dressing rooms, lockers, showers, golf shop, starters and amanger's offices and other facilities ." There would also be a 40-acre park including a Dwight Gibbs -designed "modern swimming pool, bathhouse and community clubhouse" along with an indoor gym, 5 ball diamonds, basketball courts, children's play areas, a football field, an outdoor gym, a picnic area, a soccer field, 14 tennis courts, an archery range, a band shell, and (now gone) fly-casting pond. On May 29, 1957, the City of Los Angeles leased land within the park to Signal Oil and Gas Company and Richfield Oil Corporation for oil and gas production . The city generally took a 20 percent royalty, from which it would pay the federal government's 6 1/4 percent. They signed a further lease on December 28, 1960 . The leases, set to expire on May 28, 1992, were extended another 35 years – to May 28, 2027. Young participants of the 57th Annual Model Yacht Regatta, held at the Cheviot Hills Casting Pond. The event was sponsored by the Elementary Industrial Arts Office Division of Career and Continuing Education of the Career Education Services Unit. Photograph dated May 31, 1980. (Courtesy Los Angeles Public Library, Herald-Examiner Collection.) The pond is gone; the last reported regatta there was May 9, 1986 .